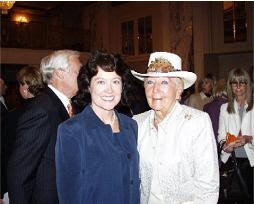 The Crohn's and Colitis Foundation of America (CCFA), Greater New York Chapter held its thirteenth Annual Women of Distinction luncheon on May 10, 2006. The event was held at Waldorf Astoria and honored three extraordinary women. The honorees included Vera Wang, a well known fashion designer, Susan Lyne, President and CEO of Martha Stewart Living Omnimedia Inc. and Madeline Boyd, Senior VP of External Affairs for NY Mercantile Exchange. Vera Wang is a native New Yorker who understands women who embrace fashion was honored with the Women of Distinction Fashion Award. She was the youngest ever Vogue fashion editor and stylist where she remained for 16 years until she moved to Ralph Lauren as a design director. She opened her own store in 1990 where she sold her collection. She was honored at the 2005 Council of Fashion Designers of America (CFDA) where she received "Womenswear Designer of the Year".Madeline Boyd has been a member of the Exchange board since 1998 and a gasoline trader on the Exchange since 1987 and was honored with the Women of Distinction Award for Finance. She is the only woman to serve on its executive committee as well as being the president of the NYMEX Political Action Committee. As president the foundation has grown from an annual budget of $125,000 to more than $2 million in 2004. She is also a chairman of the New York Mercantile Exchange Charitable Assistance Fund. 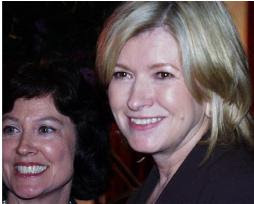 Susan Lyne became president and CEO of Martha Stewart Living Omnimedia in November 2004. She is responsible for all aspect of media and merchandising company including Publishing, Television and Internet segments. Lyne was the President of ABC entertainment until April 2004. She oversaw many hit television shows and she regularly served as the entertainment division's strategic director. Lyne was honored with the Women of Distinction Award in Media, and due to a family emergency, Martha Stewart graciously accepted the award on her behalfThe hostess of the event was Co- Anchor of ABC News, Primetime and Nightline, Cynthia McFadden. She is directly affected by the disease and considered it an honor to be apart of the event. The chairs of the luncheon, Pauline Arama-Olsten, Ellen Crown, Elyse Newhouse and Michele Sweetwood have all been touched by the disease and have raised $2 million in the past two years. Tess Koman, a 14 year old high school student from New Jersey, was declared a "Rising Star" because of the work she has done with New Jersey Congressman Frank Pallone. She has suffered from the disease and has "spearheaded the Inflammatory Bowel Disease Act". Vera Wang's Fall 2006 collection was previewed along with a fashion show presented by Bergdorf Goodman. A raffle was also offered to help raise money for the CCFA.The Crohn's and Colitis Foundation was founded in 1967 and is the leader in the fight against Crohn's disease and ulcerative colitis. CCFA has been apart of the research and has helped to educate people and raise awareness of the disease. In addition they offer support groups and have advocates in the government. CCFA is a nonprofit organization which is supported financially by individuals, foundation and corporate contributions. For more information on CCFA please view their website http://www.ccfa.org/.